CHARLOTTESVILLE, Va.—Most scholars avoid delving into historical records of levitation and other forms of psychokinesis. Dr. Michael Grosso, however, has deliberately delved in. The implications concerning human nature and its latent potential are as important to understanding our present and future as any lessons history has to offer, he said. For millenia, human society had various “methods of dialogue with the divine,” he said. Within the past few hundred years, however, humanity has increasingly turned to an absolute materialism, denying anything that has not been physically measured. Yet glimpses of something more are not fanciful; they are grounded in real experiences. 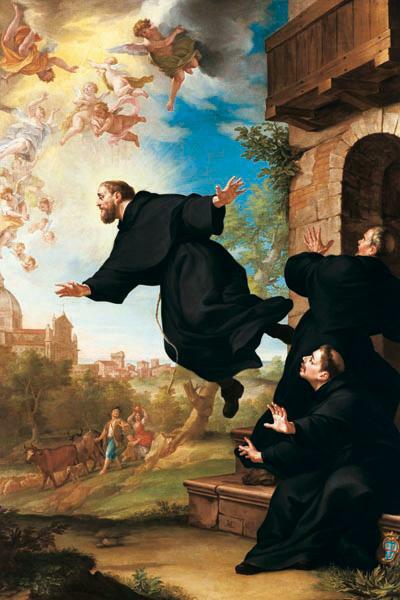 St. Joseph of Copertino (1603–1663) sometimes hovered a few inches above the ground, sometimes flew high in the air—in front of large crowds all over Italy. The church canonization process involves in-depth investigations, and thus many written records, including 150 eyewitness testimonies, providing detailed information about Copertino’s levitations. The church canonization process involves in-depth investigations, and thus many written records, including 150 eyewitness testimonies, providing detailed information about Copertino’s levitations. The church at the time didn’t have a motive to falsely boost a performer of miracles, Grosso said. There’s no reason to believe the church records give anything other than the hard facts. Copertino faced as much distrust as welcome from the church over the decades. He was moved from location to location and received vague warnings against levitating—likely because he was powerful in his ability to draw a large following wherever he went. Copertino was even under a kind of house arrest in Rome at the same time as Galileo Galilei, albeit for very different reasons. One was a mystic, the other a driving force of modern science, both were viewed with mistrust. He did not intentionally levitate. He levitated while in a state of ecstasy. At certain points during mass, Copertino would apparently become so affected that he would enter an altered state of consciousness and begin levitating. He was oblivious to everything around him, though he caused quite a stir. It interfered with his ability to conduct masses. There’s a reason people today don’t randomly start floating while in line at the grocery store, Grosso said. Copertino had the right conditions. Not only was he in an altered state of consciousness—an ecstasy, due to his faith, which seemed integral to his ability—he was also a product of his time. It’s not that people of that time were more gullible or more likely to participate in some mass delusion. It’s that the Reformation of the Church, the Baroque culture, the common practices of fasting and entering into solitude, all created a kind of environment in which one could more easily enter an altered state of consciousness. It was a mentally jarring time. Could an event or change in modern society create similar circumstances? This would require a mass “disruption of ordinary human existence,” he said, which would propel us into a collective state of consciousness more open to our latent abilities. Rather than some catastrophe or traumatic event, he would hope this could be achieved if science unites with a quest for higher consciousness. Copertino and others throughout history as well as in our time across many cultures, have displayed various supernormal abilities. Copertino was also said to perform healings and to emit the “odor of sanctity.” If a single person could develop all the latent abilities reported in scattered accounts, “What you would have is a super human being—a superman, a superwoman,” Grosso said. Psychokinetic abilities may not always flare out in dramatic displays like Copertino’s levitations. Perhaps people all over the world today are exercising psychokinesis in more subdued forms, and maybe without even realizing it, Grosso said. You can pre-order Grosso’s book, “The Man Who Could Fly: St. Joseph of Copertino and the Mystery of Levitation,” on the Rowman & Littlefield website. Observing Psychokinesis in a Lab—Researchers Taking Psi Mainstream? How to boost your body's gamma wave and infrasonic wave emissions by hundreds or thousands of times. While quick and simple "tests" are often highly publicized, the more technical data that could support the existence of psychic abilities is easily buried in academic papers.